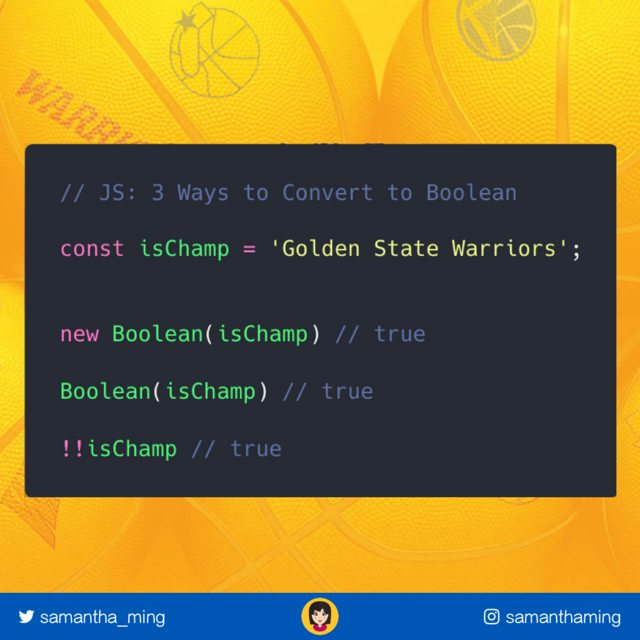 3 ways to convert a value to a Boolean. My favourite is using !!. It’s also the recommended method by Airbnb’s style guide. The first ! coerce the value to a boolean and inverse it. In this case, !isChamp will return false. So to reverse it back to true, we put another ! on it. Hence the double use !!. CJ J.: It's worth noting that the first style isn't a boolean but rather an instance of Boolean. Primitives are cheaper and should be preferred over the object type. CJ J.: new Boolean(str) returns an object type. Boolean(str) just returns a primitive boolean. I would suspect Boolean(str) is faster then ! !str because it's only one operation, but it's also entirely possible that browsers implement an optimization such that when they see !! they know to directly cast the argument to a boolean primitive (instead of actually doing NOT() twice in a row). CJ J.: Primitives are cheap because they're immutable so you can share references and not have to hold any state on the instance. It's just true or false. But new Boolean(str) is an object. It has it's own unique memory address and it can hold internal state that is unique to it. This means it can't just hold a reference to an immutable singleton instance. Every call to new Boolean(str) instantiates an entire new Boolean() object. CJ J.: This is the classic example. If you get a list of string values separated by commas and you want to filter out the empty strings, you can pass the Boolean constructor function into Array.prototype.filter and it will automatically strip out the zero-length strings leaving an array of only valid strings.